This is our review of the Upperdeck lounge at Glasgow International Airport. I first reviewed the Upperdeck lounge in Glasgow just over two years. I didn’t plan to review it again, but there has been a big change – the kids play area, which was the only stand-out thing about the lounge, has gone. I thought it was worth updating my original article. The photos are all new except where noted. 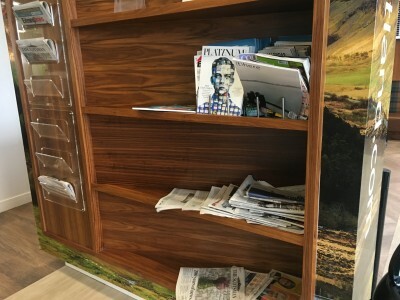 Whilst British Airways has its own lounge in Glasgow (it is very pleasant and I reviewed it here), there is a second lounge in the airport – the Upperdeck lounge. This is your alternative to the BA lounge if you have a Priority Pass or HSBC World Elite credit card LoungeKey card, or your only option if you don’t have access to the BA facility. You will also be sent to this lounge if you are flying with Delta or Virgin Atlantic. Emirates passengers do not use it – Emirates has its own lounge. The Upperdeck lounge was previously known as the Skylounge – you may know it under that name from a previous visit. It appears to be run by Aspire / Servisair (they sell access on their website and the wi-fi network is called ‘Servisair’) but does not carry either of those brands. For some reason, the Upperdeck lounge didn’t really do it for me. This is purely a personal opinion though – it is big and light and it may well work for you. Part of my lack of enthusiasm for the lounge, I think, is that it looks a bit like you are still inside the main terminal! The British Airways lounge is designed to feel like a private club and does give a sense of being apart from crowds. The photo of the reading selection is from 2017 but it is still as messy today! A new bar has also been added in part of the space previously occupied by the play area. There is a very small kids seating area in one corner but it is about 5% as much fun as it used to be. In terms of access, the Upperdeck lounge is a member of Priority Pass (free with American Express Platinum). It is not, however, part of Lounge Club (two free passes with the free American Express Gold). It is part of HSBC’s LoungeKey. You can also pay for entry. You can pre-book spaces on the Aspire / Servisair website here at £23 for adults and £17 for children aged 2 or above. If I was back in Glasgow and flying British Airways, I would choose the BA lounge over Upperdeck. That is due to the BA lounge being rather impressive rather than any failings here – Upperdeck is perfectly acceptable. 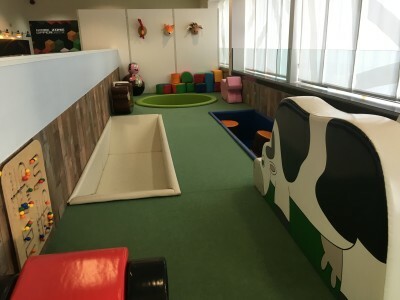 It is only a shame that the only unique selling point – the best kids facilities of any UK airport lounge – has now gone. I found this lounge very disappointing on both visits in last 2 years. They should hand over the running of it to whoever runs the friendly well-stocked little lounge at INV. No! You can’t have an Orange uniform in Glasgow! Are you trying to start a sectarian riot? Hooters…. my very proper client contact in the USA was trying every which way not to say why she was recommending that I avoided the Hooters near the hotel for dinner. Perhaps not suitable for the lounge in Glasgow, you naughty Shoestring! Terrible lounge. At morning peak there’s often a line to register and the grand dames of Glasgow are not known for either smiles, customer service or the handling of technology !! Layout is atrocious – milk nowhere near where it’s needed. Clearly someone who doesn’t cook or serve food designed this layout. Versace Glasgow Holiday boozbags love this lounge as they drink their bodyweight in alcohol and shout loudly across the lounge or into their phones “we’re on the lounge!” Some of us applaud the removal of the kids play area as it created an additional sonic nightmare with this wipe clean flooring ! Banquettes are SO poorly done and newspapers have never been good here. Mags selection even worse. Why any business traveler would rate this is beyond me. I’m Glasgow born and embarrassed by this lounge. As a BA Gold customer why on Earth would I favour this place over the BA Louvre. Local term “weegies” for loud mouthed Glaswegians sums up the mainstay clientele. No thanks. I find the upper deck appalling. Seems to me that many non business passengers are happy to pay the entrance fee because they can drink more than than the cost of the fee. That died not create a good impression to business passengers. Maybe that’s what the owners want? Hope not. Is it really so bad?! I have been twice and find it unremarkable, but I certainly didn’t find it as bad as some of the comments today make out. I can imagine it may vary a bit depending on how many stag/hen parties have paid for access 😉 Have noticed this a bit at Aspire EDI sometime, folks clearly trying to get 2-3x their entry fee in booze…. I was in this lounge again this week. I’d go as far as saying it’s my least favourite lounge in the UK. The lack of hot food offering is pretty poor. We struggled to tell the descriptions of the soups apart between the sign and reality. It’s just a pointless, soulless space sadly. Can I use the ba lounge when flying Flybe with a ba flight number and BA silver? When I use to fly Emirates Economy, I alwats used this lounge with my Priority Pass. On each occasion around the afternoon, it was nice to find a seat by the window and a power point. Grab some food to make a cheese cracker and try the soup. It’s an average lounge in comparision with the Aspire Lounge in Amsterdam for example. Perhaps it’s time for an improved revamp of hot food choices?